Cronk smiled and let them in. With teeth that mouth did brim! And let the birds begin. As fast as he was dim. He quickly cleaned Cronk’s chin. Who gazed ’round with chagrin. Your mouth smells like a bin! Cronk’s mouth was finally clean. Cronk’s beady eyes did gleam. Far plumper than his kin. Was fat where they were thin. Cronk did an awful thing. Cronk didn’t say a thing. They never guessed Cronk’s sin. The worst they’d ever seen! Their poor lost chubby twin. 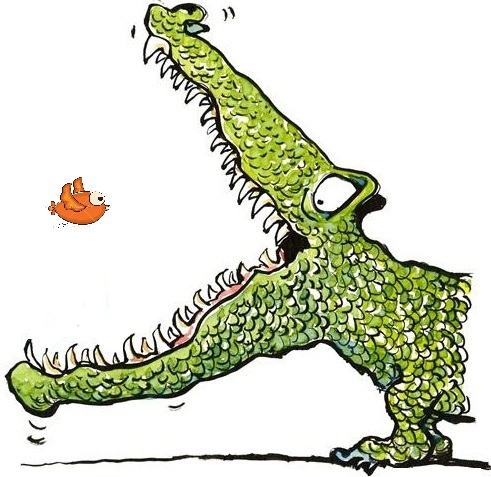 This entry was posted in Poetry and tagged Bird, Crocodile, Humor, nature, poetry by Kevin J.J. Murray. Bookmark the permalink.